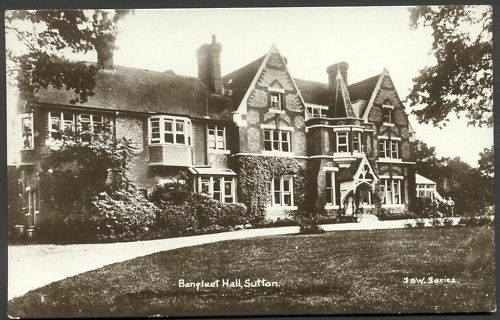 Benfleet Hall was one of two manors covering the Benfleet area – the other smaller one was Jarvis Hall. It was located in the area now occupied by undertakers and the Methodist church. In time they both came to be owned by one family – the Appletons, but not for long as the family ran out of male heirs(circa 1710). While Jarvis Hall still exists, Benfleet Hall does not alas…the circumstances of its demise a mystery to me at present. Fast forward to the nineteenth and twentieth centuries and you find Benfleet Halls springing up in Surrey. What’s going on ? Surely Surrey is landlocked and cannot claim to have tree-lined creeks (Beam = tree, fleote = creek). The name changed to Benfleet Hall at the behest of Miss Helen Gifford, who had been the Principal of the Marie Souvestre School in Sutton. Having failed to find any connection between this lady and Benfleet, Essex, I moved on to the Local Studies and Archives Centre at Sutton. They were able to confirm that there was a house in Sutton on the second edition of the Ordnance Survey map of 1896 called Benfleet Hall. The house stood in Benhill Wood Road in a parish area known as Benhill, later Benhilton. On the first edition of the Ordnance Survey map of 1868 the house appears as Benhill House. It was apparent that in moving her school from Sutton to Cobham she had retained the house name that folk would be familiar with. So why Benfleet Hall in the first place? If she had chosen the name, why use Benfleet and not Benhill ? Trawling the internet for any reference to Benfleet Hall and Sutton, I came across a familiar name… which I then checked against the 1891 census . This confirmed that the head of the household was one William Appleton, a (rich)tea and coffee merchant, aged 69. He was not in residence at the previous census, so we can assume the name changed at some point between 1881 and1891. Presumably another branch of the family, but exactly what the connection is I know not. Any information would be appreciated. Together with my sisters – Angela and Gillian Collins – I was a pupil at Benfleet Hall during the 1950s until Miss Gifford’s retirement in 1961. Originally called Sandroyd, the house was the second house built by Phillip Webb (the first being The Red House in Bexleyheath) including wonderful tiling which may have been the work of either William Morris or, more likely, Philip de Morgan. Eleanor Roosevelt had attended Marie Souvestre’s Allenswood School, where she was taught by Helen Gifford. Mrs. Roosevelt’s desk was still in use in the 1950s, her name carved into the lid . My mother died recently at the ripe age of 92. 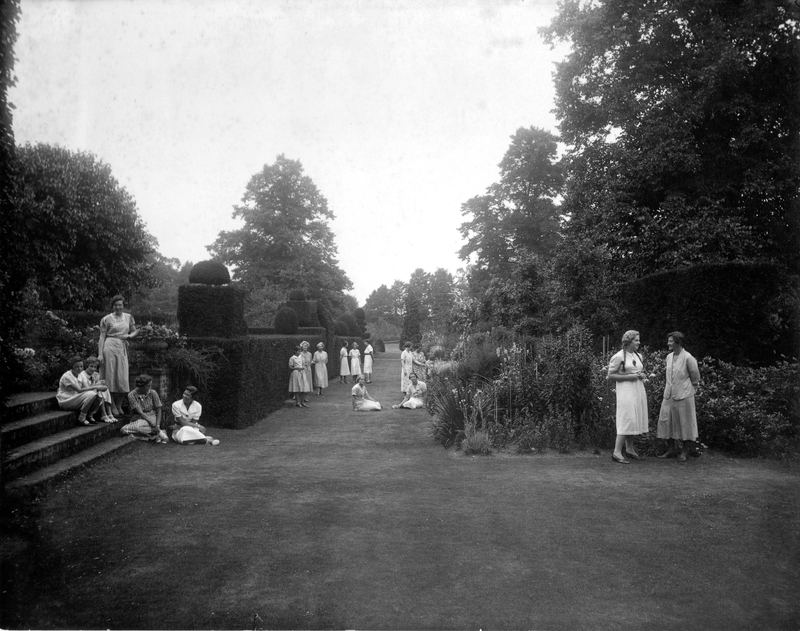 She went to Benfleet Hall – probably in the 30’s and I have just found some photographs of it. One in particular is stagily posed in the grounds with some of the pupils and staff. I read in the Benfleet Hall Community archive that you had an interest in Eleanor Roosevelt, who (presumably) was there in the 30’s as well – or was it earlier? I am attaching a photo (added to the post above) which may be of interest in case the young Eleanor appears there. My mother is seated second left on the steps and glowering at the camera / depressed. See if you can spot Eleanor Roosevelt there? I have recently discovered your interesting website. I was a boarder at Benfleet Hall at age 11, from Autumn 1939 for 4 terms. I remember Miss Gifford & Miss Hemming well. My mother & her 4 sisters all had their schooling there, as did my grandmother, Dulce (Emily) Waterlow, who was at Marie Souvestre at the same time as Eleanor Roosevelt. Have been fascinated to read Mark’s article which has prompted me to delve further into the history of Sandroyd and Benfleet Hall and write my own story. I was at Benfleet Hall from 1951-3 and have the school photos for the three years. Although I haven’t kept in touch with anyone, I can name everyone in the photos! Would be interested to hear from anyone also any residents of the apartments of the present Benfleet Hall with information on the internal layout of the building now. I attended Benfleet Hall during the summer term in 1954. I think I was the first Swede there; my name was weird so they called me Gorilla. All in good fun. Miss Hemming introduced me to algebra very well. I had a lovely time there. Miss Gifford of the lovely white hair left for the United States shortly after I came to the school. Years later when I was living in New York I read a biography of Eleanor Roosevelt. It turned out that she had attended the Marie Souvestre School. She was very shy at the time and had no self- confidence, but was brought out of her shell by a very special teacher – Miss Helen Gifford! Mrs Roosevelt began inviting her friend to spend summers with her in the States as soon as the war was over. I found this little tidbit fascinating and am happy to share it. I’m a french woman writing a book about Marie Souvestre and her mother, Nanine Souvestre. I find today that two schoolgirls of Allenswood opened this school in Sutton. Do you know something more about the school? I read that the principal, Miss Gifford got pictures and things from Allenswood. Does somebody have an idea where are they now? And the famous library of Marie Souvestre ?? I read english better than I write! I went to Benfleet in the forties leaving in 1947 after school certificate. I was then Julienne Russell (usually abbreviated to Julie). My friends were Pam Bates whose father was head of Odeon Cinemas and Shirley Warter whose father, Sir Philip Warter, was head of ABC Cinemas. Although food rationing was in operation we did get treats of ice cream brought to school by these two girls (it was still sold, although in short supply, in the cinemas). I was also close to Sally Talbot Wilcox, who is now in North Yorkshire and is Sally Ropner. Anne Disney was a relation of Walt! I think I was the only nobody! There was a lovely atmosphere in the school and once one reached 15 one could ride one’s bike into Cobham on Saturday morning for coffee. This was allowed if you asked to go in French. We will all be 82 now, as I am, and I wonder if any of my fellow pupils are still with us. I went to Benfleet Hall (Cobham) from 1955 to its closure in 1961. Miss Gifford was our headmistress and her long standing friend Miss Hemming was assistant head. My father sent me there after being told that the school had originated in France and therefore the teaching of french was very important. Don’t suppose this helps you but it may.